For very large boats we have introduced 'Heavy Duty' versions. These are extremely robust and is intended for larger boats (6.5 metres (21 ft)), or very heavy duty applications. Used as an option for certain unusual trailers where the Latch has to be installed too far forward without support at the front - and you risk bending the base - the spacer provides support. The Wedge side plates are used with the Latch Support to adjust the angle of the Latch to the Snare on odd trailer and Bow combinations. Some trailers with unusual winch posts may need changing Easytow make a post which is designed to suit, together with a winch top and associated bolts. The combination if Angle and Support are both required. This option allows you to tilt the angle up or down by 14 degrees. Used where the roller needs to be able to project out further to the bow. More commonly required on Towing Eye (Aluminium) boats. This is a straight bolt on option avoiding drilling, cutting etc. These are 4 adjustable positions plus tilt. You need to add six M12 galvanised bolts with washers and nylon locking nuts. Brochure.....‘Using Your L & R TM Boat Latch’ This covers tips on how to use the product effectively. The 6 page publication is included in the box... but you can also get a printable copy. Note:- Installation & Use of the L & R Products The products need to be installed, and used, in accordance with the printed instructions on the packaging, printed inserts and the information published on the website www.boatlatch.com. Release & Retrieve takes no responsibility for product that is not installed and used within these guidelines. 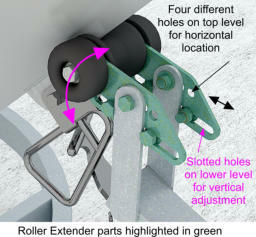 Brochure.....‘Using Your L & R TM Boat Latch’ This covers tips on how to use the product effectively. The 4 page publication is included in the box... but you can also get a printable copy. Note:- Installation & Use of the L & R TM Products The products need to be installed, and used, in accordance with the printed instructions on the packaging, printed inserts and the information published on the website www.boatlatch.com. Release & Retrieve takes no responsibility for product that is not installed and used within these guidelines.